It’s not always identity theft that stops LinkedIn users from wanting to provide their contact information on their profiles. There are times when someone may be dealing with a stalker or an abusive person. In these situations, LinkedIn does allow you to limit a person’s access to your profile and LinkedIn activity. 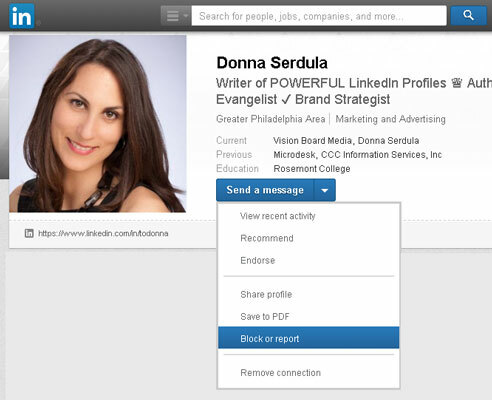 You can only block people from your desktop using LinkedIn’s website. LinkedIn’s mobile application does not yet allow the ability to block people. In the LinkedIn search bar, type the name of the person you want to block and click the search button. A list of profiles matching the name appear as search results. Open the profile of the person you want to block by clicking the search result. When you view a person’s profile, depending on your settings, that person may be able to see that you viewed his or her profile. Once you block the person, you disappear from his or her Who’s Viewed Your Profile section. Hover your mouse pointer over the down arrow next to the button in the top section of the member’s profile and select Block or Report from the list, as shown. A Block or Report this person dialog box appears. Blocking a person on LinkedIn. When you block a person from viewing your profile, that person is not alerted and should not know anything is amiss. Only you can unblock a person you blocked. When you block a person, you won’t be able to access his or her profile, and that person won’t be able to view yours. In addition, you won’t be able to see each other’s LinkedIn activity or message one another. If you are connected, that connection goes away along with any endorsements or recommendations that person gave to you or you gave to that person. Any previous views listed under Who’s Viewed Your Profile are wiped. Lastly, all suggestions under People You May Know or People Also Viewed stop. The block only works when the person is logged into LinkedIn. If he or she logs off LinkedIn and accesses your public profile, that person is still able to see your public information. To keep your profile truly private, you should also hide the public version of your profile that’s visible to search engines and people not signed into LinkedIn.